A couple of months, I had emailed my readers with the latest Featured Artist post and asked my readers if they wanted to be a Featured Artist to email me. Tim Carney did just that. 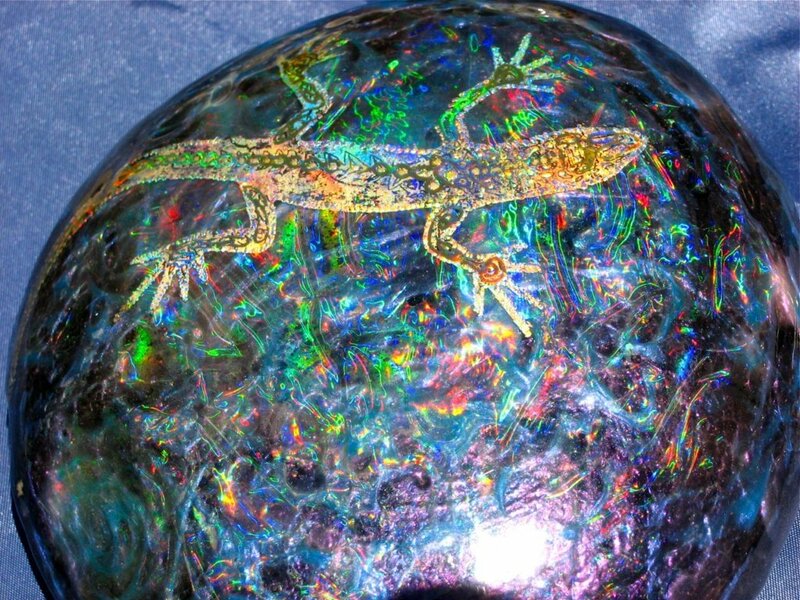 I was fascinated by his rock designs called “Alien Opals” using foils. I have never seen that done before and I thought it was very intriguing. 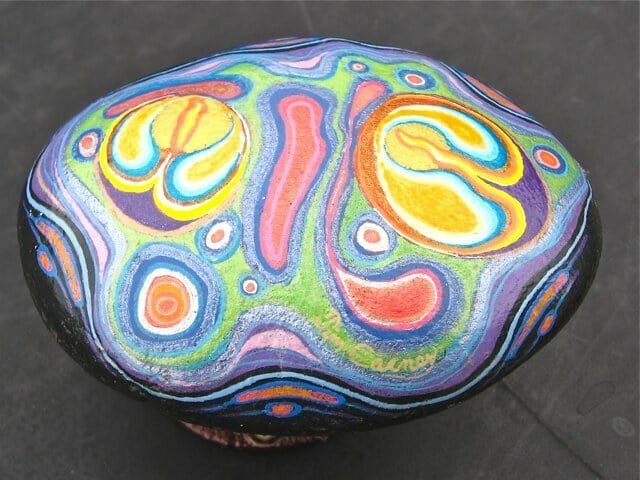 Tim has given us unique insight into his creative process and his 5 rock painting tips that you won’t want to miss! 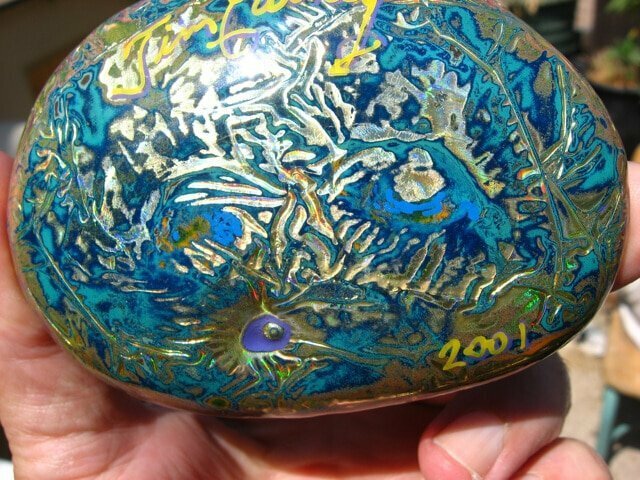 I get requests from all over the world from very talented artists and I enjoy sharing their creative journeys, their helpful rock painting tips, and shining a spotlight on their rock art for all to enjoy. 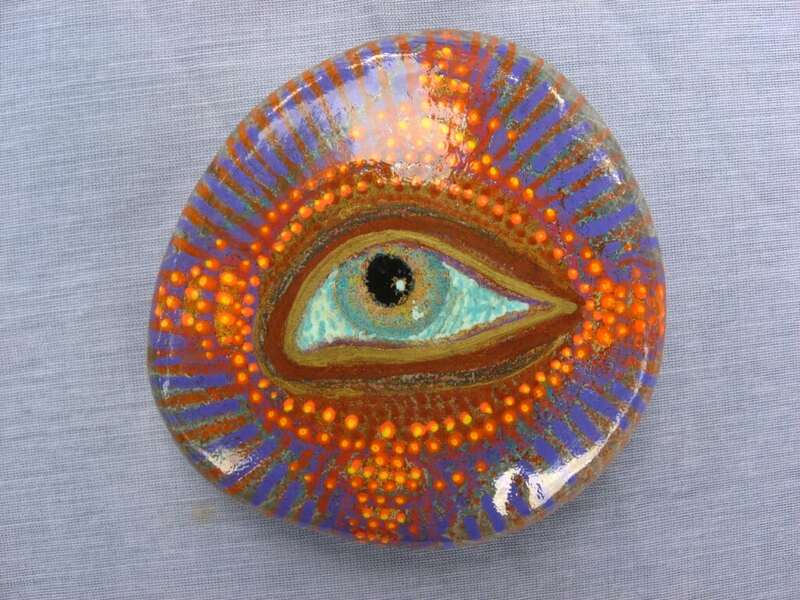 First of all, tell me a little about yourself, and how you got started painting on rocks? Tim: “I’m still discovering what happened to me and what I might do. I am and always have been a student and devotee of Light and Color. When I was 4 or 5 yrs. old my family lived in Long Beach California where Navy Blimps flew over several times a day. There were lush gardens in the apartments. A huge bed of my lifelong favorite flowers was there. 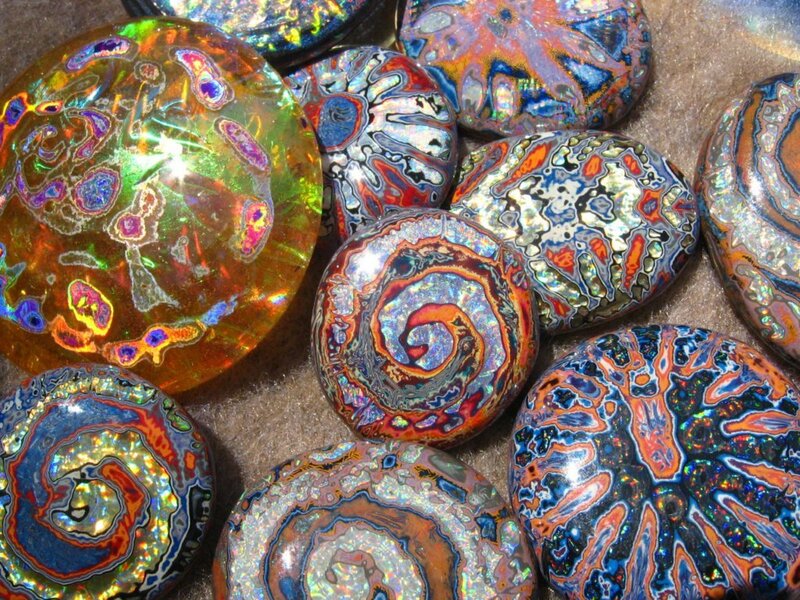 The clusters of red, orange and crazy colors dazzled my eyes and drew many butterflies. I developed my eye-hand coordination by teaching myself how to catch butterflies. The brown ones were catchable. Typical hunter-gatherer male child I was. There were fantastic iridescent Bluish Purplish butterflies that I could never catch. Later I found some dead ones on the ground within the Lantana Bush. The wings had the magic blue in them and I gathered up about 5 of them. My immediate urge was to make paint of them. Magic Blue! How many 5 yr., old kids think about making paint? I went into the kitchen and asked my Mom for a can lid to mash the wings up in water. Greyish brown mush. No blue! I was shocked by this failure and reviewed the experiment in my mind for years, but later decided to understand and comprehend all things related to Light and Color. I know exactly why crushing up the wings killed the colors. And so, my first intellectual love in life was Science, followed by my drive to produce Art that reminds us of our energetic existence. 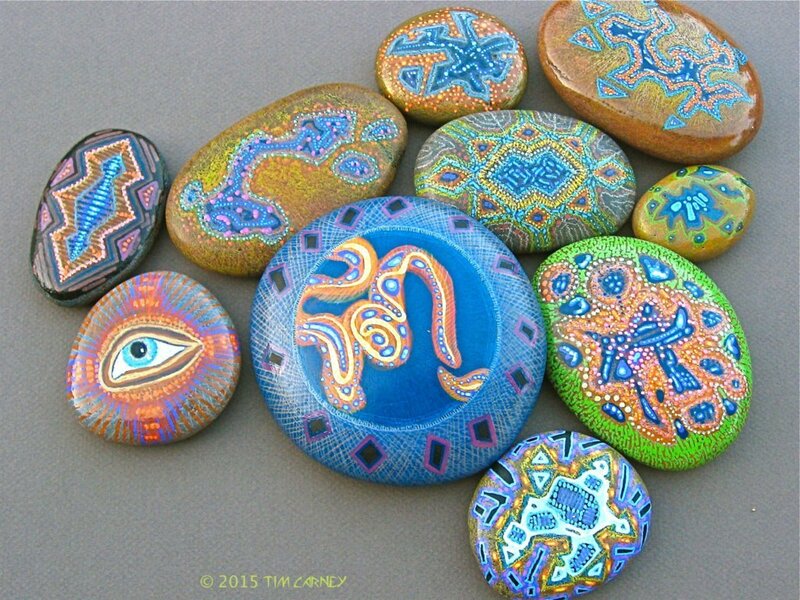 I started painting rocks in Jr. High. 1967, after doing acrylics for a couple of years. My home town Fontana, CA built a new city hall and used thousands of black basalt pebbles probably from Rosarito Beach, Mexico. Do you like to create in other mediums? Tim: “My first mediums were drawing with pen and ink pieces with a super fine pen called a ‘Crow Quill’, followed by watercolors, acrylics, pastels, Prismacolor pencils. Mixed media is fun media! I also experimented with the colors that appear when sheet metal is heated with a propane torch to make a mobile. In the 70’s I was doing mostly acrylics on canvas and panels. I became interested in automotive paints and airbrushed a design on the sides of my friend’s van. There was a boom of that kind of art in SoCal then. I continued with airbrush works after that. At the same time, I spent many of my days experimenting with high voltage electricity, chemicals, and anything that could make colored light and colored materials. This was my greatest source of entertainment and accomplishment. I also had lots of ideas of things I wanted to make and invent, and my sketchbooks are stuffed into 3 milk crates. Many or most of my paintings and designs were conceived in sketches before starting the works. In the 90’s I noticed printed works that used Foils and new holographic types were getting attention in the printing industry. I dropped everything and started ordering foils to play with, and technical info on their application. Tim: “To walk you thru my creative processes, which are many, I think this cool video explains a bit about the way creative people like me think. Tim: “I’ve been studying the nature vs. nurture conversations about creativity for most of my life. When I was a child, I associated most of the words I knew with mental pictures and saw them as clearly as I do today. That was my way of understanding the world around me. For example. I was a toddler and did something wrong and an adult yelled at me “Did you do that on Purpose”? I didn’t know what the word purpose meant, but I was familiar with the color Purple and saw that in my head when she asked me the question. I was not able to reply to such an obtuse query. Fast forward to my 4th-grade class in Bloomington, California. Oh….. This is all about what inspired my creativity. A huge book of classical and Modern Art was placed on a table for the class to check out during breaks. We were flipping thru the huge book and there were many amazing paintings and sculpture masterpieces. Salvador Dali……….Oh, God! “The Persistence of Memory”. My jaw dropped. I got a strange kind of chills, and my mind was set on fire. I had to stretch and expand my concept of what is possible. I knew that the painting was done with brushes by a Human Man, but the idea of making watches limp pancakes on branches and ants walking in formations and all the crazy stuff in the work told me that images can surpass and or enhance Reality. The painting Touched My Brain! Dreams can become paintings, and some of my paintings are true ‘Surreal’ compilations. 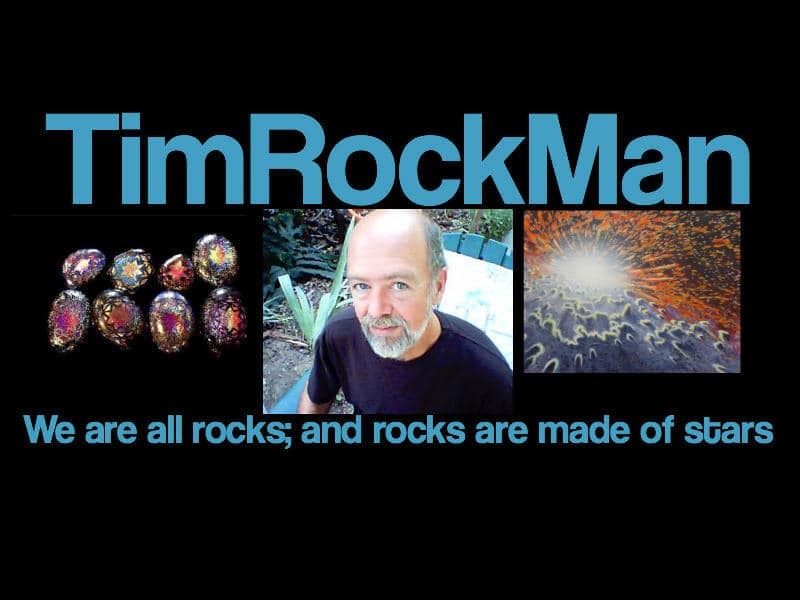 Tim: “When I’m planning a new batch of rocks. I look at the many experiments, and best examples, and failures that I keep around in view of my workplace. I always do groups of similar shaped and sized stones. I’ll share my ‘painting support boards’, which I feel is a very needed tip for all rock painters. 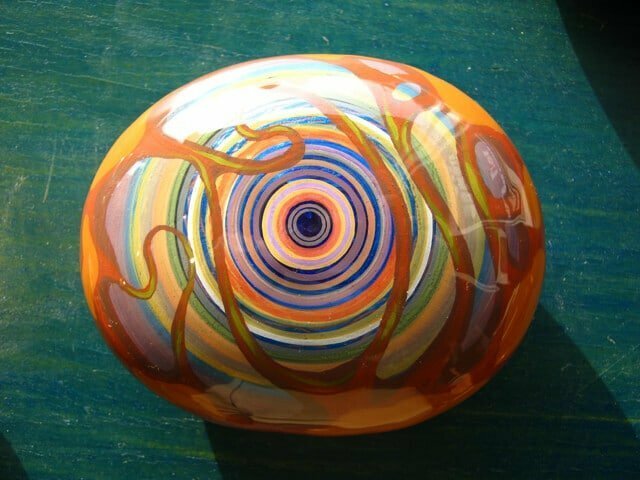 If you want to sell Art Stones, do them in Batches to multiply your effort and profit. Doing the same thing several times on several stones can be a meditative and satisfying activity when you’re ‘In the flow’. If you hit on a great painting method you will have 5 to 12 or more products. 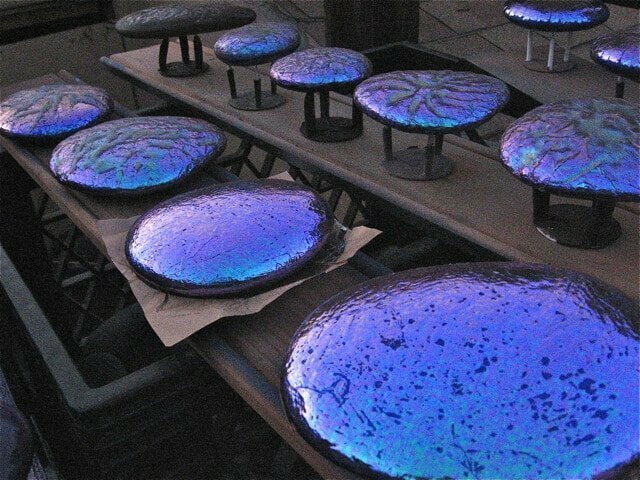 “When I made a big sale for a couple thousands of my rocks to LACMA, the Director / Buyer was a little bothered by the way they were decorated on top but the dull raw stone on the underside with my signature and finish date. I was laying them on boards and just painting the tops. 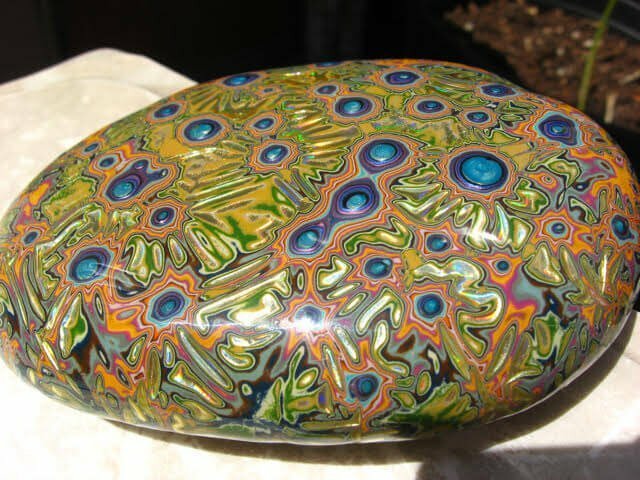 I had to invent better methods of painting my rocks! I didn’t get any more sales with them. Failure. Here are top and bottoms of a rock done as described. Tim: “I made nail-spiked boards that were two feet long by 4 in X 5/8ths. Thank you, Tim, for enlightening our readers on your fascinating creative journey and for being a loyal reader as well. Click here to learn more about Tim Carney’s artwork a.k.a. The Rockman.